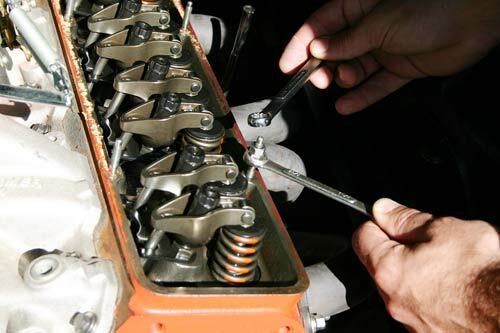 Tip: When replacing your valve cover gaskets, it’s a good time to think about other similar upgrades such as valve covers, breathers, or plug wire retainers. 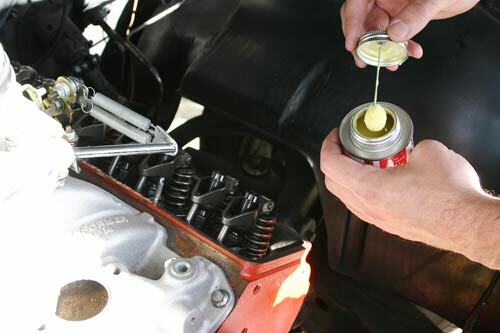 Using a small putty knife, remove the old gaskets and thoroughly clean the ridge of the cylinder heads. Apply a small amount of gasket glue to the backsides of the gaskets, as well as the mating surface if necessary. To insert the stud, lock the two nuts together and turn clockwise. Nothing is more annoying than the constant dribble of oil running down the back and sides of your motor due to leaking valve cover gaskets. Not only does it burn off the exhaust and smoke when driving, but it also makes a mess of your clean driveway at home. Sure, as long as you keep plenty of oil in the motor, there is no problem. But why take the slacker approach on something so easy and inexpensive to fix? 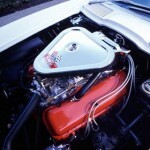 The first thing you want to do is remove any hoses, breathers, or hardware attaching to the valve covers. 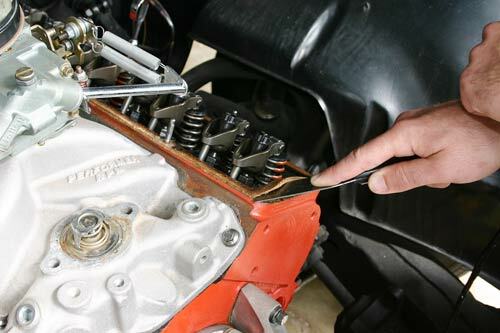 Loosen the valve cover bolts and retainers and set them aside. Even if you replace them with studs, it’s always a good idea to hang onto old hardware for anything that may come up later. Every mechanic needs a random, leftover bucket-o-bolts. With the valve covers off of the heads, remove the old gasket material with a scraping knife and thoroughly clean the mating surface. 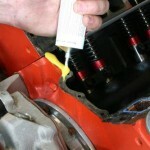 This will play an important part in the proper re-sealing of your valve covers. 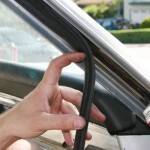 The new gaskets will have a hard time resisting leakage if they are installed on an oily or dirty surface. One thing to watch out for here is any gasket remnants or debris falling into the cylinder heads when cleaning. To avoid such contamination, place a clean rag just inside the head below the gasket mounting surface. This should catch any sludge or chunks that come off in the process. Carefully fold the rag inward and remove when completed. Although replacing valve cover gaskets is a pretty simple task, it can often be a pain to do so properly. The gaskets never seem to stay in place long enough to install the covers and find the bolt holes again. Fortunately, the answer is simple; valve cover studs! 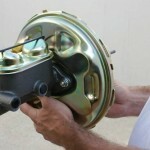 They make the chore of gasket replacement about as simple as you can get. When screwed into the cylinder heads, the studs serve as the perfect placement locator for both the gaskets and the valve covers. Installing the studs is equally basic. They are threaded on both ends with a small, machined section in the center to serve as the stopping/starting point. You will most likely be able to feed the majority of the stud into the head by hand. 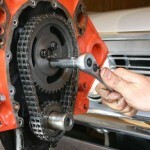 When it begins to stiffen, double-nut the upper half of the stud and drive it in with a wrench until the center section is close to flush with the cylinder head. If you not installed studs or inserts before, allow me to explain the “double-nut” method. By threading two nuts (one on top of the other) onto the stud and tightening them to each other, you create a fixed point that is used to spin the stud into its insert. After it is fully seated, simply loosen and remove the nuts. Repeat this process for all. Most valve cover gaskets don’t require the use of gasket sealer or silicon. The gaskets should make the seal by themselves. 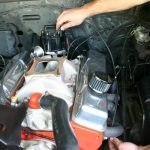 However, it is recommended to apply a small amount of placement glue to the backsides of the gaskets to keep them from sliding out of position when installing the valve covers. Gask-a-cinch works great for this kind of thing. It’s thin, lightweight, and it sets up in a few minutes. With the gaskets stuck in place on the cylinder heads, simply lower the valve covers over the studs and onto the gaskets. Install the valve cover washers and nuts and evenly snug them down. Be careful not to overtighten. You can easily crush the gasket and end up with a bigger mess than you started with. A ½-¾ turn past snug should do the trick. Fire up the motor and check for any leaks. Re-tighten as necessary.